Healthy Origins Setria L-Glutathione reduced is a naturally derived substance that is a biologically active sulfur amino acid tripeptide compound containing three amino acids: L-Cystene, L-Glutamic Acid and Glycene. 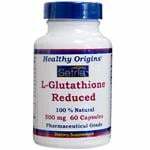 Our Glutathione Reduced is produced exclusively in Japan through a fermentation process and is pharmaceutical grade, the highest quality available. Take one (1) or two (2) capsules daily with meals or as directed by a physician. Gelatin, Microcrystalline Cellulose, Magnesium Stearate, Purified Water. Free of Sugar, Salt, Starch, Yeast, Wheat, Gluten, Corn, Barley, Fish, Shellfish, Nuts, Tree Nuts and Milk Products. No Preservatives, Artificial Flavors or Synthetic Colors.